Of course, one of the top benefits of staying in our cabins near Dollywood is the convenient access to the park! The entrance to Dollywood is only a short drive away from your cabin’s front door so that you can quickly head over to the park. This means that you can easily be one of the first guests in the park each day to take advantage of the short lines in the morning at the top attractions! While other folks are busy driving miles on the Parkway in traffic just to reach the park, you will already be inside having a blast on such great rides as the Wild Eagle, Lightning Rod and Mystery Mine! The cabins at Hemlock Hills Resort Rentals are already a great deal for your Pigeon Forge getaway, but we have many awesome discounts and deals to make your trip even more affordable! This means that you can save a significant amount of money on your vacation, leaving more funds to spend at Dollywood and other attractions in Pigeon Forge. After all, this is why you are taking a vacation to the Smokies in the first place and we want you to enjoy every second of your trip at an affordable rate! Click here for our latest discounts and deals! One thing that you are definitely going to want before and after a day of exploring Dollywood’s 150 acres of fun is a great night of sleep! We are pleased to offer comfortable accommodations that are sure to provide a delightful night of rest on each night of your vacation. Each cabin is situated in a lovely setting nestled among the mountains where the peace and quiet will lull you to sleep! Choose from a variety of cabins with up to 5 bedrooms where you can plan a romantic getaway with your sweetheart or schedule a getaway with friends. Another great benefit of staying in our Pigeon Forge Cabins near Dollywood is the access to a variety of incredible amenities designed to enhance your vacation! Our cabins feature bubbling hot tubs that feel wonderful on your feet and muscles after walking around Dollywood. Each cabin at Hemlock Hills Resort Rentals also features a full kitchen where you can prepare a breakfast before heading to the park and cook other meals during your stay. Other amenities in our cabins include such great features as big screen televisions, air hockey and pool tables, free Wifi access and more! 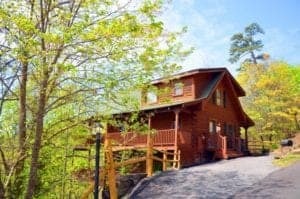 Check out all of our Pigeon Forge cabins near Dollywood today to plan your getaway to the Smoky Mountains! We look forward to seeing you soon at Hemlock Hills Resort Rentals!